Yatzer sat down with Cayce Zavaglia, an American born painter raised in Sydney, to discuss her work, influence and perspective on her paintings. 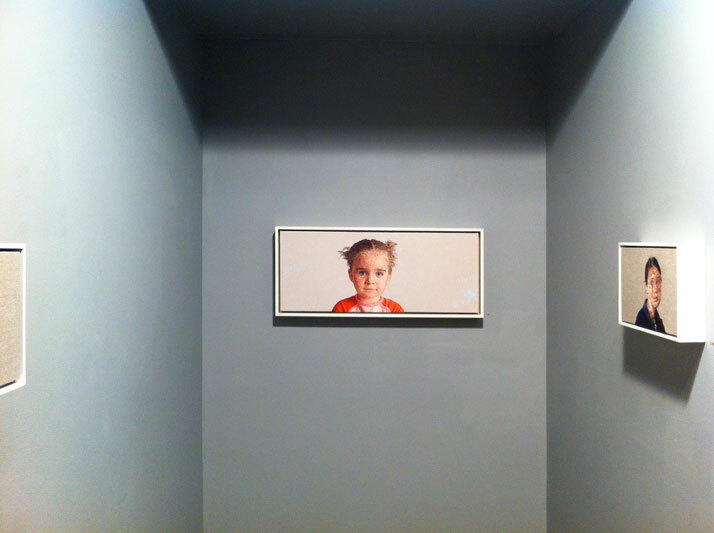 We have seen her work before but this time we got the chance to witness it first hand at the Lyons Wier Gallery in New York City (November 17 - December 17, 2011) and it was a delight. The embroidered paintings give you texture from afar and mesmerize you as you move closer. Her intricate layered strokes cross each other in many directions to mimic paint strokes. The layering of colors is so close and tight that from afar, you will never guess that it was made up of sewing threads. After visiting her latest exhibition in New York City and seeing the paintings up close, we knew we had to get close to her to further understand the intimacy of her work and story. Your background in painting is fundamental to your process. How did the idea of utilizing embroidery come about? I was pregnant with my daughter and knew I could no longer be around all the turpentine and varnish and so began investigating other possible mediums for my work. After experimenting all summer with a variety of new materials, I came up with nothing. 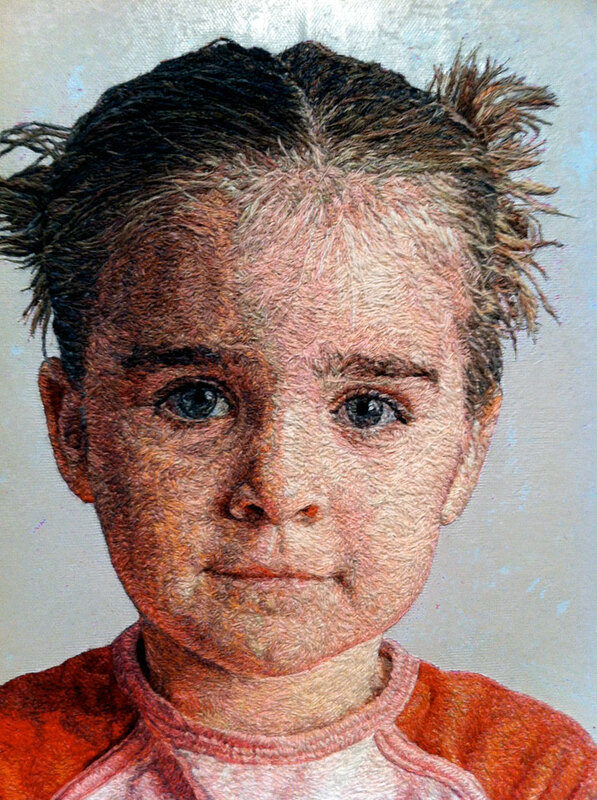 I kept thinking back to a crewel embroidery piece that I had made as a child and wondered if it would be possible to sew a portrait…or perhaps use the material in a more modern way. As you are from the great American Midwest, how does your 'home' play an influence in the creative direction to your work? I spent my childhood years in Sydney, Australia and my high school years in Texas. It wasn’t until college that I made the Midwest my home. I’m not so sure that in this Internet age that the Midwest has such a direct influence on my work as much as my own “home” does. I began this series as I was starting my own family and now ten years later my “home” continues to impact my work. My kids’ naps, school, and carpool schedules all dictate when I can work in my studio. My subjects continue to be friends, family, and now my children. At Yatzer, we have remarked on how architects, industrial designers and fine artists have returned to the crafts. Why do you think craft is, once again, making a mainstream push? I think the popularity of craft comes and goes but it has always been there and has always been weaving and integrating itself into artwork. It is familiar. It is comfortable. It is something we all know. Every child in America has made crafts. At some point, however, a dividing line is drawn between art and craft and a choice must be made if one wants to be a “real” artist. I think craft is once again making its presence known because of a universal appreciation for something unique…something tied to tradition…something that possesses the visible signs of craftsmanship and the time that has been applied. What is the role of American craft in today's artistic landscape? Name some of your influences in it? Thanks to blogging, the Internet, and of course Martha Stewart… it is hip to love craft again. In today’s artistic landscape, the most successful work integrates “craft” but then in an instant makes you forget this connection. Recently someone described my work in this way. 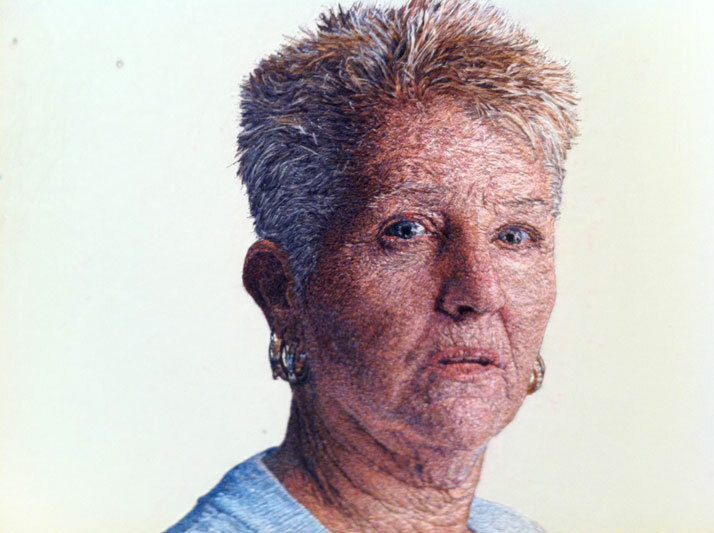 They initially thought the portrait was a painting, they were so surprised to find out that it was all hand embroidered that they got lost in the portrait again. The fact that it was embroidered no longer mattered. In my own work, I continue to be more inspired by other painters and artists than those who practice “craft”. 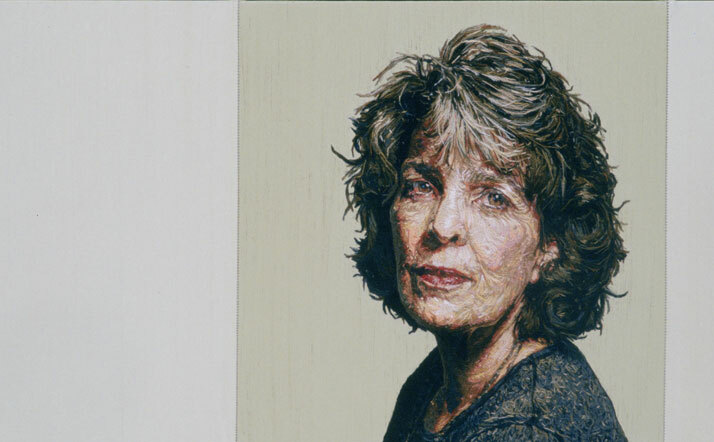 I love the portraits of Loretta Lux, Chuck Close, Lucien Freud, and Jenny Saville. 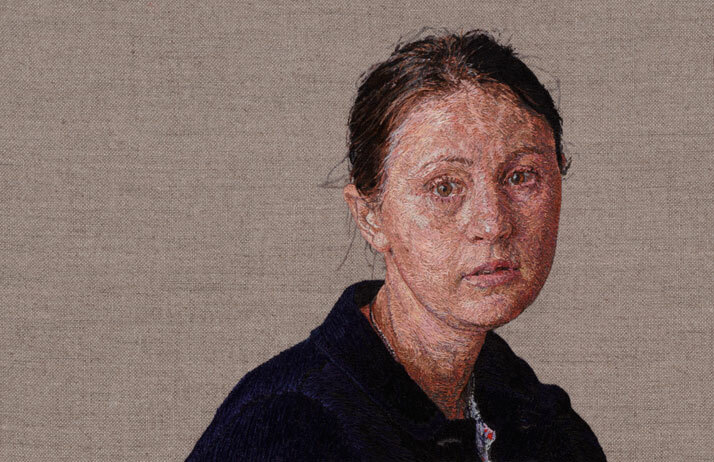 There are other artists who also integrate sewing and embroidery into their work: Jenny Hart, Alicia Ross, and Tilleke Schwarz all make really inspiring work. If I had to name one direct source of inspiration for my own work it would have to be the color sensibility created by Martha Stewart. Her paint colors have directed the choices made for the backgrounds of my larger works. 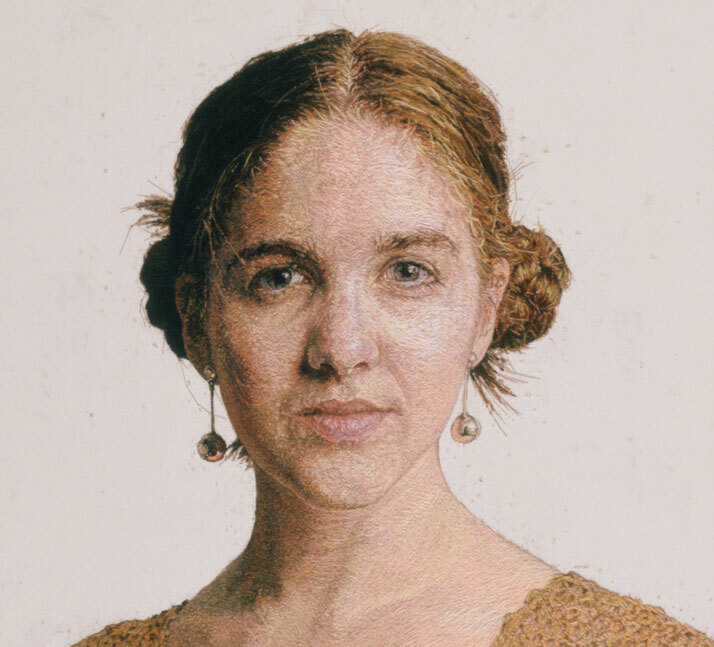 In which way(s) have you found is embroidery similar to painting? I visually break up the portrait just like I would a painting working on one section at a time. Decisions regarding color, direction of thread, and value are similar to those same decisions made in painting. My work has always been about a dual interest in the image and facture of the piece. This ideal is most evident in my sewn works. Over time, the stitches have become more and more obsessive. My goal is to return to the looseness of my paintings and find a way to translate the fluidity of a brush stroke in wool. How does the process differ when approaching a portrait from this medium? Initially, the most frustrating part was not being able to mix the color that I was seeing. 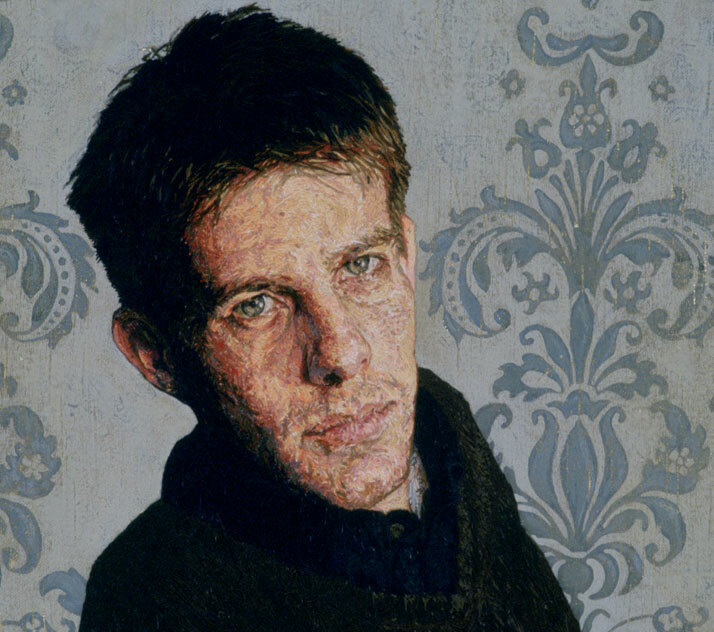 So I approached the portrait with more of a pointillist sensibility. By laying down various size stitches in a variety of colors, I was able to give the allusion of the color that I wanted…but didn’t have. This system is different from a pixilated approach…which would lay colors right next to one another. My stitches are layered on top of one another, which allows some to peep through and others to be obscured underneath. The process of stitching vs. painting is much more labor intensive. I can only stitch so fast. However, this method of working is much more conducive to popping into the studio and working on the piece for an hour or so…and with painting I always felt I needed a chunk of 4 hours time to make it worth my while. Looking at your work, it is evident that the product is indeed a painting. How would you explain that painting is what most people see as something that is paint based? My definition of painting was most challenged during graduate school when fellow students were integrating sculpture, performance, and sewing into their “paintings”. I think we all know what the traditional perception of what painting is, what it looks like…and what it is supposed to be. However, I think in today’s contemporary art culture, painting is more exciting when we find out it is not what it is supposed to be. Seeing that an artist has stretched his/her own imagination and consequently forced the viewer to do likewise, makes for a more meaningful dialogue between the artist and viewer and for the advancement of painting in general. 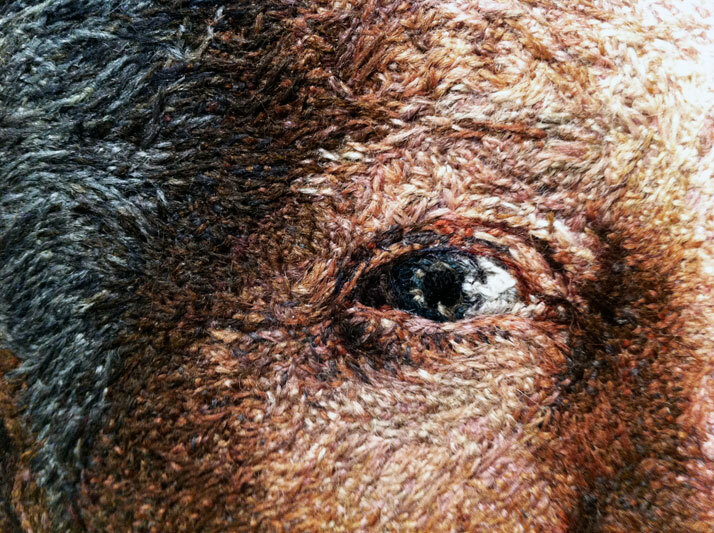 In my own work, using wool instead of oils has allowed me to broaden the dialogue between portrait and process as well as propose my own definition for the word “painting”.